Successfully Added Adjustable Angle 206 Channel Car MP3 FM Modulator to your Shopping Cart. 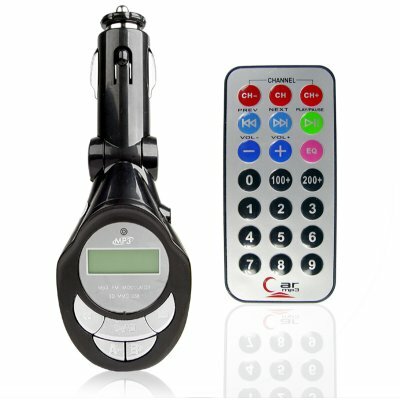 Incredible 206 Channel Adjustable Angle MP3 FM Transmitter. This new model works like any normal FM Modulator but offers you the choice of over 206 channels to choose from. It is compatible with USB sticks/ MP3 players and SD Cards. The adjustable neck allows you to adjust the LCD display to the best viewing angle. A great item for high volume sales if you take advantage of Chinavasion's factory direct price and assortment of secure shipping options. Order your sample today! on 2009-12-23 11:02:41 awesome product! this is an awesome product, works very well, and delivery was painless and on time. thanks! The product works as advertised. It's fantastic that for such a low price I can now listen to my MP3 collection using a USB stick or SD card or line-in along with this device...... all without having to pay to get a new stereo installed! Thank you Chinavasion for a great value product! I actually like this one better than the one twice the price. on 2009-03-12 21:28:14 Everything went well, I am satisfied. Everything went well, I am satisfied. I get what I buy.